From left: Catharine White Steward (1818-1867), John Steward (1814-1901), John Steward (Jr.) (1847-1923), Harriet Steward Stuyvesant (1842-1872), and Campbell Steward (1852-1936). I am fortunate in that my parents and grandparents took photographs and preserved the photos of the generations before them. My paternal great-aunt Margaret Steward (1888–1975) was the genealogist of the Steward and Beeckman families, and she was careful to identify the sitters in family photos whenever she could. Through her efforts, I have three photographs of the Steward Homestead in Goshen, New York, from the 1850s. These pictures show different collections of Stewards, Whites, Le Roys, and Mariés, the parents, siblings, and other kin of my great-great-grandparents, John Steward and Catharine Elizabeth White. The one of my great-great-grandparents and their three children (above) is the easiest to decode. My great-grandfather is the youngest child in the photo, carefully hovering over his toy cannon, still a family heirloom more than 150 years later. His older brother, John, is dressed for play, unlike Campbell in his velvet dress and lace collar. Between them, holding a straw hat, is Harriet Le Roy Steward, the family beauty. After her death in 1872, her widower (Augustus Van Horne Stuyvesant) took their three children, the youngest only a year old, to live with Mrs. John Steward’s mother on West Twenty-first Street in New York: four generations of Whites, Stewards, and Stuyvesants lived under one roof for more than thirty years. The next photo, taken the same day (note Aunt Harriet’s hat and John and Catharine Steward’s clothes), shows a larger group, and includes my great-great-great-grandmother, Harriet Banyer Le Roy (1797–1885), from 1816 Mrs. Campbell Patrick White. (She is shown in profile, leaning against her daughter Ann White and next to Catharine White Steward.) 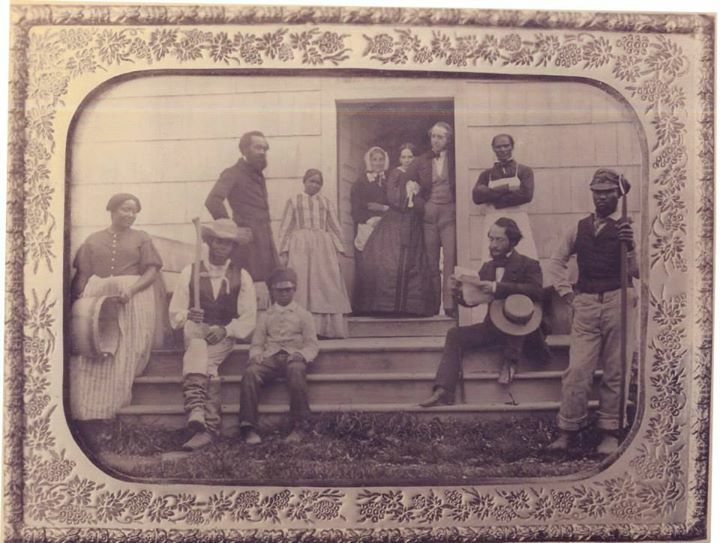 I am more confident about the women in the picture than the men, as Aunt Margaret wasn’t so sure herself: the three mysteries are the elderly gentleman seated at left, either Campbell Patrick White or John Steward’s uncle Gabriel Steward, both of whom died in 1859; the man in the cravat, standing at center left, identified as Daniel Jackson Steward (1816–1898), John’s brother; and, between his White nieces, Harriet White’s brother Goldsborough Le Roy Banyer (1802–1866). 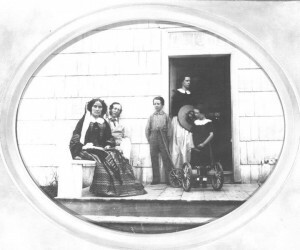 The women in the photograph share a family look, as they are (from left) Catharine Steward’s sisters Cornelia Le Roy White (1825–1911, seated), Mary Martha White (1822–1903, standing in the doorway), and Ann White (1820–1914, behind her mother). 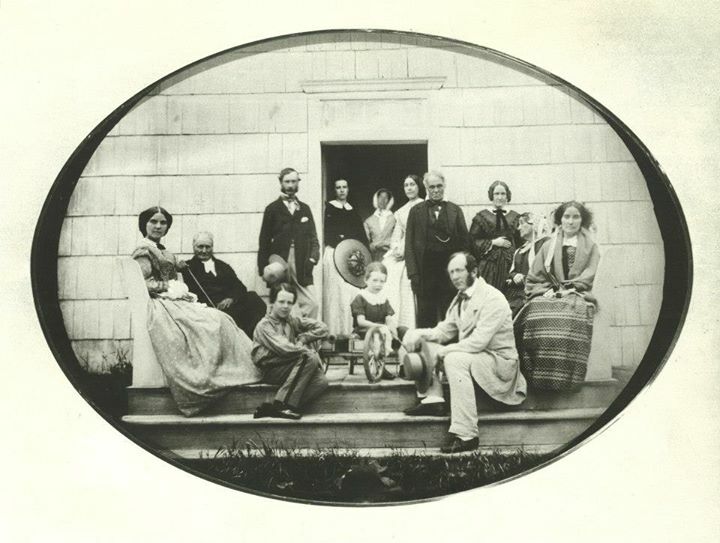 As I look at the photo, it occurs to me that the fellow with the cravat, who does not particularly resemble Uncle Jackson Steward (see the final photo below), might actually be John Campbell White (1817–1904) – which would account for all of Campbell and Harriet White’s surviving children circa 1859. In these photographs I can trace family likenesses. The Stewards were fair and redheaded; the Whites were pale with blue-black hair. Harder to know, at this late date, whether the elderly men shown in the second photo were Campbell White and his brother Henry or Gabriel Steward and Le Roy Banyer – and there is probably no one left who could identify them! You’re the best. I am so grateful that you have organized and maintained our family’s history, dear bro. Great photos! I have nothing that goes back so far but the family tradition started in the late 1800’s was to take four generation pictures. We have a visual lineage of Albees, Monroe’s, Maces through eight generations. Thank you, and congratulations on that four-generation tradition! Where was the house located in Goshen? Georgeann, it was on Greenwich Avenue, I think, and since then demolished and replaced by a cloverleaf. I have nothing that goes back as far as you do with the kind of identifications you’ve got. But we’ve had family reunions on both sides of the family for years–65 at least on my father’s side, because I remember going to them as a child. On my mother’s, they began probably 40 years ago, when I wasn’t living in the area–western WA. My father was compulsive about having a group picture, and had a camera with a 10 second delay, allowing him to set up the picture and then race to get in it. When it was developed 8 1/2 by 11, he made a chart with all the heads numbered, and listed who everyone was. For each family, all those pictures and diagrams went in a 3 ring binder. Unfortunately, when he died in 2000, the notebooks went missing. One’s now surfaced. The picture habit did remain, but nobody kept up the habit of making the chart and identification list. I’ve tried to take over that responsibility, but it is very difficult as children grow up to keep track of who’s who. I now have a digital camera of my own, and am following my father’s tradition. So while there are holes in the past record, I’m determined to keep the record clear for family historians to come. Great story, photos… your reference to stories and photos are inspiring for me to apply to my own family story. thank you. Christopher, it’s nice to hear from you! We should connect some time to share our family portraits and other info.